Purchase this product now and earn 2,500 Reward Points! Acid Soothe™ was formulated for the person suffering from any discomfort associated with gastrointestinal distress. 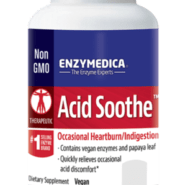 The ingredients in Acid Soothe™ provide the body with pure plant enzymes for delivery, along with nutrients specific to the gastrointestinal region. Marshmallow has been found to relieve irritation of the mucous membranes of the respiratory and gastrointestinal tracts and to help normalize mucous secretions. Papaya Leaf has been known for its wonderful digestive work and contains proteolytic enzymes (acts on protein). Papaya Leaf has properties to protect the stomach mucosa from damage and ulcer formation. Prickly Ash is known for its support of the glands and aid in tissue repair, colic, ulcers and gastrointestinal distress. Gota Kola is known in India as a longevity herb and is uncommonly rich in B vitamins and potassium. Suggested Use: 2 capsules of Acid Soothe at the end of every meal to prevent digestive discomfort. 2 Acid Soothe may be taken any time digestive discomfort begins. 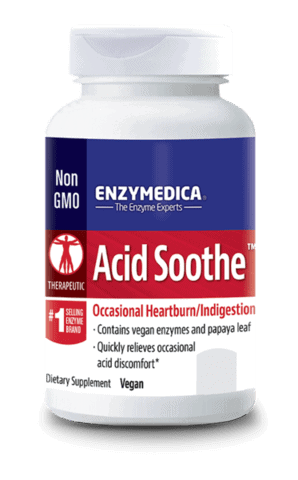 The ingredients in Acid Soothe provide the body with pure plant enzymes for delivery along with nutrients specific to the gastrointestinal region. Marshmallow Root has a high protein and mucilage-carbohydrate content which the body can use to manufacture the necessary materials for new tissue production. Marshmallow also has mucilaginous (adhesive) properties enabling it to surround and expel foreign and toxic matter, having a soothing effect on the inflamed mucosal membrane tissue. Marshmallow has been found to relieve irritation and inflammation of the mucous membranes of the respiratory and gastrointestinal tracts and to help normalize mucous secretions and sooths acid reflux. In conditions where inflammation is induced by excess accumulation of uric acid, Marshmallow Root helps remove this acid from the body.